Shingle roofs has an average lifespan between 15 – 30 years. So how do you know if it’s time to replace your shingle roof when it falls within the range? 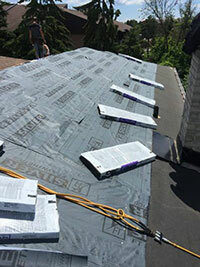 There are many tell-tale signs that you can look for that indicates your roof needs replacing. Ignoring these signs or doing patch roof repairs may result in unnecessary damages to your property and possessions. Not sure how much to budget for a roof replacement? Click here to find out the average cost of replacing a shingled roof in Ontario. There are many signs you can look for when determining if you need a new roof replacement. Go through the list below and do a walk-thru of both the internal and external checks. Increased energy bills – If your energy bills are rising – check your roof! Your roof acts as an insulator against the hot and cold weather changes. If it is damaged you will notice an increase in your utility bills because your air conditioner or heater has to work harder to maintain the desired temperature in your home. Sagging roof deck – The roofing “deck” consists of the support beams that hold your shingles and roof up. Once these beams start sagging or show evidence of moisture damage, you should replace both your shingles and your roof deck. Signs of water damage – Water leakage, however minimal, if unaddressed will become a much bigger issue. Mold, fungi and bacteria can grow within 24 to 48 hours of water penetration. Light visible through the roof – Cracks and holes in your roof will allow light as well as rain water to come in. To check, turn off your lights when on the top most floor when the sun is setting and look for visible light penetrating through the roof. Old looking roof – Since most roofs come with 20-25 years warranty, you should consider replacing even if it appears fine as there could be unidentified underlying issues which can be costly to fix if left unaddressed. As curb appeal is important; you do not want a roof that detracts from it. Condition of the shingles – Inspect your roof for cracked, torn, bald or missing shingles. If several of them appear wet, stained, curled, bent, broken, and darker than normal or are missing – it is time to consider replacing them all at once. Unwanted growth – If you find moss and algae on your shingles, it is time for a replacement. Moss traps moisture against the roof’s surface which overtime in freezing temperatures causes damage to the granules shingles’ surface. By replacing your shingles, the unwanted growth will be disposed of and new shingles are algae-resistant! Shingle granules – When shingles begin deteriorating, they break off in miniature pieces that look like dark, coarse sand. 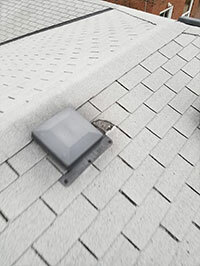 Therefore, you will start seeing granules in your gutters or on the ground – this is a sign of advance deterioration. 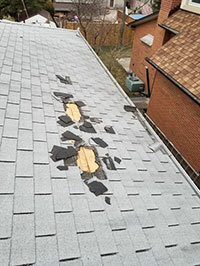 Damaged flashings – Flashings are located around skylights, valleys, eaves, rakes, wall details, stacks and chimneys. They are all subjected to separation due to general expansion and contraction which will cause fasteners to become loose and the bottom-flashing flange to lift; allowing water to enter. Integrity of drainage – Inspect all drainage ensuring that all gutters and downspouts are securely attached and free of debris and any other obstruction. Inspecting your roof habitually and making minor repairs as required will prevent you from having to spend exorbitantly on repairs and maintenance later. It is also recommended to do regular Spring maintenance to ensure your roof is in optimal shape. However, if your roof has reached the end of its useful life; a delayed replacement can result in water damage, health risks (mold and mildew), structural damage, devaluing your home and lastly your home can become a fire hazard if water gets into contact with electrical wiring. It is recommended that you inspect your roof twice a year – during the spring and fall seasons. If you are unsure if your roof is due for a replacement, let us take a look. At Nailed It Roofing & Constructions, an experienced roof inspector will perform a thorough roof inspection and will provide you with a detailed roof inspection report along with a professional opinion on whether your shingled roof needs replacing. 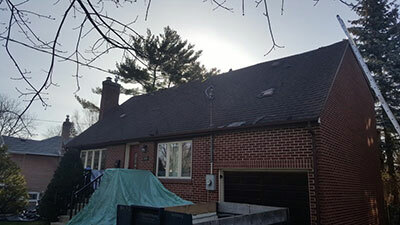 Replacing a damaged roof is the best investment you make to ensure your loved ones and belongings are well protected. 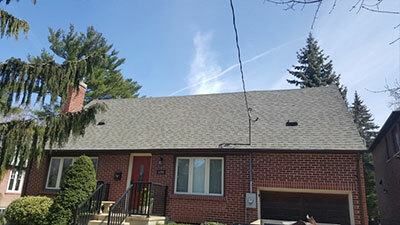 Nailed It Roofing has been installing and replacing roofs for residents of Mississauga, Oakville, Milton, Burlington, Brampton and the GTA for over 15 years. Give us a call today for a free estimate.